Nicky, stop being naughty! I hope Sammy is soon able to start his radiotherapy. I am praying for Sammy. I would love to see photos of you kitties. 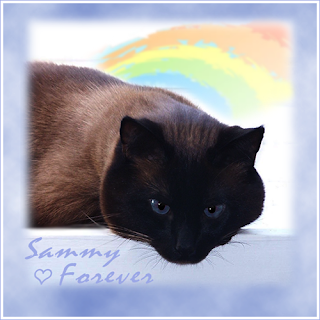 Bring give Sammy the peace he needs to get better - I'm thinking the rest of you guys can take care of yourselves. Shenanigans indeed ! Just the normal amount of fun and chaos at Meezerville. Miles, you should eat well. It sounds quite exciting in a noisy way at your den. now stop all the squabbling and be at peace...is that possible?? MOL!!! It sounds like stuff is pretty much as normal at Casa de Meezer. We are crossing paws for Sammy. Do NOT chase him, Nicky!